Farinata: Farinata, socca, or cecina is a sort of thin, unleavened pancake or crêpe of chickpea flour originating in Genoa and later a typical food of the Ligurian Sea coast, from Nice to Pisa. It is made by stirring chickpea flour into a mixture of water and olive oil to form a loose batter, and baking it in the open oven. A tin-plated copper baking-pan is used. Farinata may be seasoned with fresh rosemary, pepper and sea salt. 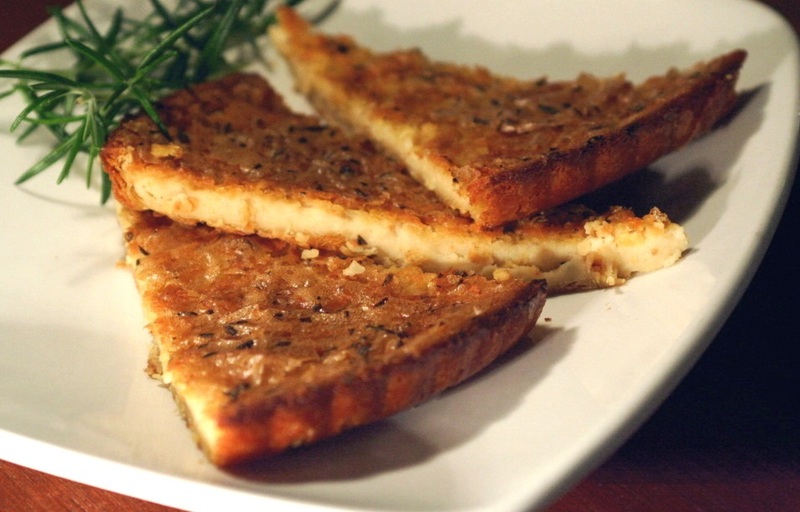 Elsewhere in Italy (traditionally in Tuscany, where it is called cecina (from the Italian word for chickpea, ceci), it is served stuffed into small focaccia (mainly in Pisa) or between two slices of bread, as it is traditional in Livorno. Note: The Farinata batter should be made 12 hrs in advance, for better results. Put the chickpea flour in a bowl. Add salt and freshly ground black pepper as per taste. Slowly add 1 cup lukewarm water, while whisking to eliminate lumps. Note: An immersion blender is ideal for this. Cover and let the batter sit for as long as 12 hours. The batter should now be about the consistency of heavy cream. Heat the socca pan on stove. Pour 2 tablespoons of the olive oil into it. Add the chopped onions to it. Stir once or twice, until they’re well browned, takes about 6 to 8 minutes. Stir the onions and rosemary into the batter, then immediately pour the batter into the pan. Cook the pancake on low heat for 10 to 15 minutes or until the pancake is firm and the edges set. Brush the top of the pancake with 1 or 2 tablespoons of oil if it looks dry. Cook just long enough to brown it in spots. Farinata is ready to be served. Cut it into wedges, and serve hot or warm.